Do you intend to take a significant impact in the lives of others with your work? Are you tired of hearing crickets when you post online? Do you desire to have thousands of potential clients, who love your work, follow you online? Do you fear if you don’t get seen and heard online the whole working-for-yourself-thing will never work for you? Have you tried to say and do the “right” things online with little to no results? Are you ready to stand out so that your ideal customers can find you, follow you, and buy from you? In 2015, I hosted the original Getting Paid to be Yourself Training. This training was a huge success with literally hundreds of people watching live and many more purchasing the recording in the time since. Last year, I hosted a Part Two of the same event. Today, I have decided to give you both for the price of one! You want to stand out online. You want to be seen. You want to be paid – and be paid well – for your great work. I’ve been there. I get this. I knew I what I wanted. I just had no idea how to get it. I had no idea how to present online, attract the clients who had been praying for me, or charge money for my work. 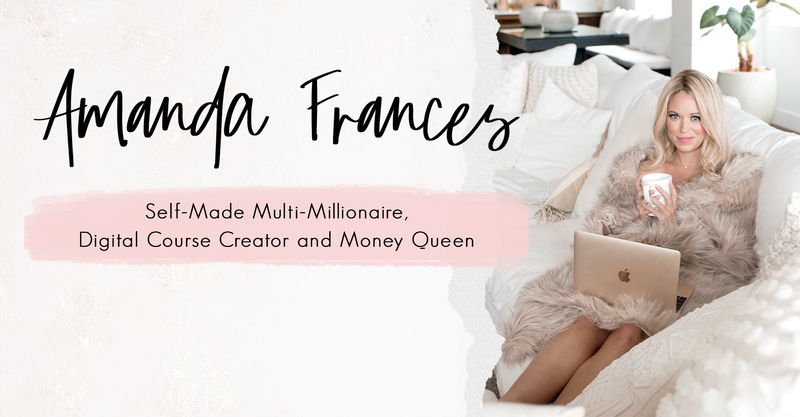 Six and a half short years later, Amanda Frances Inc will earn over $1.5 million in 2017. By being myself + sharing my truth + creating offers I love I have designed a life and business I am wildly obsessed with. I am currently traveling the world while running my business. I want to share with you everything I know about building a brand. I want to show you how to Get Paid to Be Yourself. How to grow your online presence quickly. I’m sharing the social media strategy that results in over 1k new followers each month. The missing piece to attracting the right clients – this is what they need from you to be ready to buy from you before you even get on on the phone with them. The quick mindset shift that allows you to show up powerfully online — immediately. The two main things that are likely standing in the way of clients seeing you, following you and buying from you. A new branding strategy you can implement right away – know what to do when you sign log on your computer each day. Get instant access (and unlimited replays) to both Training Videos instantly when you sign up below! The training has been recorded for you! Get Instant Access now!